I recently started using WinZIP 19 on my new laptop. Before then, I had an older version on a pc (can't remember the version number, unfortunately) which always worked just fine. It unzipped all my addon folders neatly into the Addons folder, like it ought to. What 19 does, however, is create a main folder in which to store those files/folders. *) So instead of simply dumping the content and be done with it, I now need to go into Explorer, grab everything from the newly created folder, move it up one layer so it's in the Addons folder itself, and then delete the now empty folder. It's so incredibly bothersome, especially because it feels utterly useless. I recommend ditching WinZip and using 7-Zip instead. Hm, that one actually came with this laptop; so I just went and made 7Zip the default program for .zip files and tried it. Except... it acts weird. Even when I select 'open file' instead of 'save', it saves it. I briefly see a small black screen (like a cmd screen) flash, but then it's gone and nothing happens. Nothing 7Zip-related is running in task manager, not even when I hit the downloads button on my browser and click the file from there. I just see another flash of black and that's it. Nada. 7zip has a command line interface which you appear to have made the default application, the exe with the gui is called 7zFM.exe or something. I honestly don't understand people that cling to paid software for archives like WinZIP or WinRAR when there are superior (and free) alternatives. And especially, if you're not doing anything but extracting and making simple archives, you don't even need software for it in the later versions of Windows. In any case, it sounds like you went with the "extract to <zipname>" option instead of "extract here". I recommend TUGZip. It's FREE, and I've never had a problem with it. Off-site website links aren't so much the problem; the problem is with direct links to off-site downloads (eg. 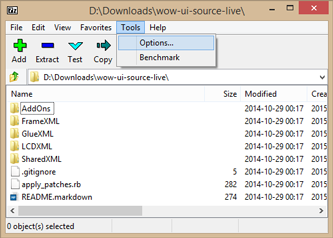 the download file itself rather than the download page) or links to mystery downloads (eg. ZIP files on sites like rapidshare) where it's impossible to evaulate the trustworthiness of the source before downloading the file. Anyway, I've been happy with 7Zip but I'm always interested in trying new things, so I'll probably check that program out later. Last edited by Phanx : 01-20-15 at 01:14 PM. Oh, OK. My bad. I thought it might have been a bad thing to link an off site page. I'm just not with the program today (or many other days, either). PeaZip is also an option. Thanks, it turns out I did indeed pick the wrong 7Zip file - I had just grabbed the one that was listed in the app panelwotsit that Windows 8 pulls up when you hit the Windows button, assuming it was the correct one (I'm trying really hard to get used to this OS, I am). It's still acting weird, though. Especially when I try to adjust some of the settings, it keeps whining about subscribers not being invoked and then refuses to accept my changes. It doesn't even remember the folder I last extracted to, nor can I set a default one myself. I don't get it. Have I been saddled with a gimped version, like so many programs that come with a new pc/laptop? 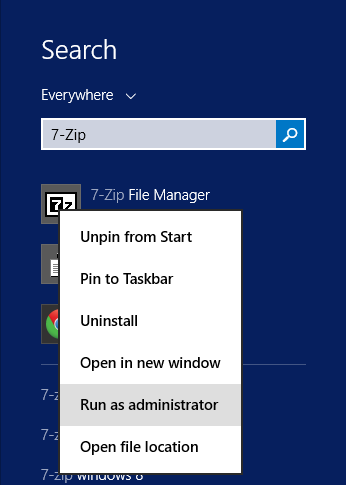 It needs to be run as an administrator to integrate into the shell (add itself to the right-click context menu), not sure about saving the other settings. Visit 7-Zip's website to download and install the newest version. 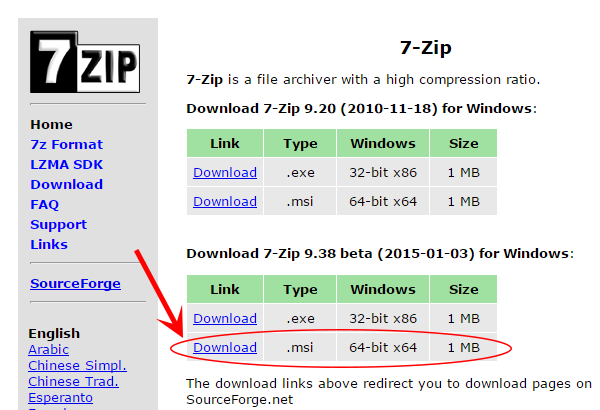 Open Search (Win+Q) and look for "7-Zip." 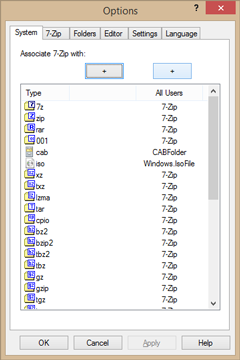 Right-click on 7-Zip File Manager and select Run as administrator. 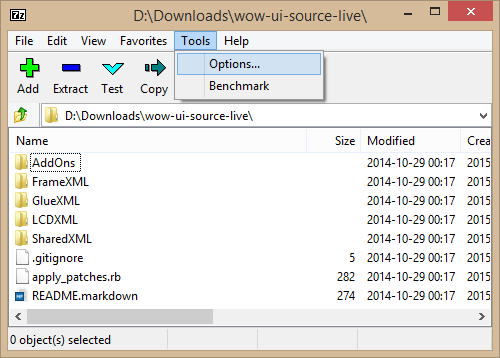 With the 7-Zip File Manager now open, click Tools and then Options. 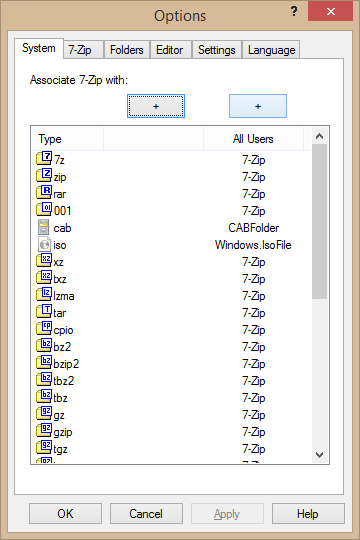 On the System tab, click the + button on the column (User or All Users) you'd like 7-Zip to associate files with. If another application is already associated with that file type, you can click it to reassociate it with 7-Zip. Alternatively, you can click the + button again to let 7-Zip reassociate with all file types it supports. Last edited by Talyrius : 01-21-15 at 08:44 AM. I indeed had to run it as an administrator in order to force the association settings, thanks for that. I completely removed WinZIP, ignored a friend who kept telling me I had to go use WinRAR because it was so awesome, and managed to get this right. It also seems that, even though it still doesn't pick my Addons folder as my standard folder the way I told it to (even when running as admin), I can select it from a dropdown list that remembers the last few locations. Which I'm more than content with.